At Branson Tourism Center we offer vacation packages, show tickets, lodging, meal vouchers, air tickets, group planning, and even gas coupons for your Branson vacation. 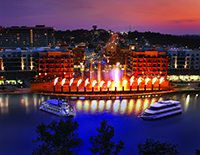 Branson Tourism Center is your one-stop, source for all things Branson. There's no need to go anywhere else but the Branson Tourism Center to plan every aspect of your Branson vacation - from tickets to Branson shows and attractions to a wide range of hotels and lodging to complete discount vacation packages, gas discounts, and more. Being the largest ticket seller in Branson means we offer you advantages and perks that you simply can't find anywhere else. You'll enjoy the peace of mind that you will never pay marked-up box office prices or added service fees. Our knowledgeable staff gives you the inside scoop on Branson and they are at the ready to customize a vacation package that includes shows, attractions and lodging with discounts you won't find anywhere else. This personalized touch can make all the difference in creating lasting vacation memories that everyone will enjoy. All customers also get free membership to our Concierge program and enjoy exclusive savings, advance notice of limited engagements and many other VIP experiences. Over 5 million tickets sold! A+ rated and accredited by the BBB 2017 Recipient of the BBB Torch Award for Ethics!